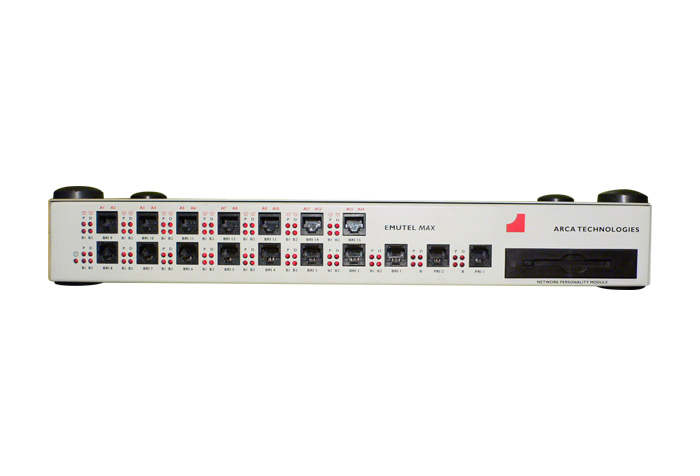 emutel Max is a standalone or rackmount unit that comes in five variants giving 8 BRI, 2 PRI and 8 BRI, 2 PRI and 15 BRI, 8 BRI and 14 analogue or 2 PRI, 8BRI and 14 analogue. emutel Max can emulate different country specific networks by adding network personality cards â€“ networks supported include North American, NTT, Euro-ISDN, VN3, ITR6 and BTNR191. Protocol analysis option is also available on emutel Max. 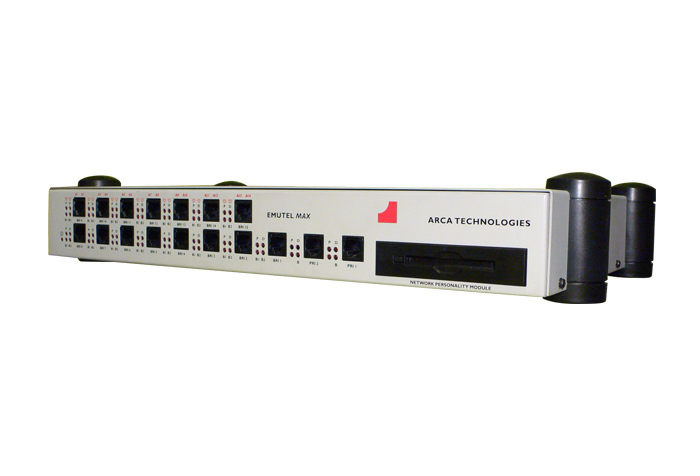 By simulating the operation of a Central Office Switch, emutel Max provides both Basic Rate ISDN (either U [2-wire] or S [4-wire] connection), Primary Rate ISDN (E1 or T1) and up to 14 Analogue Telephone connections which may be used just like regular ISDN lines or employed to carry out equipment testing. (see unit options for more details & link to unit options). Almost every feature of emutel Max can be customised, for example, the entire directory numbering structure can be changed. Special numbers activate network conditions such as User Busy or Call Rejected. Line power can be switched on or off. emutel Max is also extremely easy to use with indicator LEDs showing at a glance what each terminal is doing and a windows application program displaying Protocol Analyser information and allowing simple device configuration. emutel Max is a truly international product. By plugging in personality cards the system can accurately emulate ISDN variants in a whole range of different countries. Cards are available for BTNR 191 (UK), VN3 (France), ETSI (Europe), ITR6 (Germany), NTT (Japan) and AT&T 5ESS, National-ISDN & Nortel DMS100 (North America). Network dependent supplementary services are also supported. At just 3.4 Kg, emutel Max is easily portable and since terminals can be powered directly from the interfaces it really is the ideal system for use at demonstrations, presentations, exhibitions and in production line testing. In addition emutel Maxâ€™s universal power supply, which automatically switches between 240V and 110V, ensures that the system is transferable between the US and Europe without any adaptations. Price and availability of Emutel Max can be requested by contacting the Arcatech sales team. emutel Max with analogue may be supplied with BT â€“ RJ11 master socket adaptors if required. emutel Max may be ordered in desktop or 19â€ rack case.